Snowfall depth has been downgraded for northern Cook County from 6″-8″ to 4″-6″. 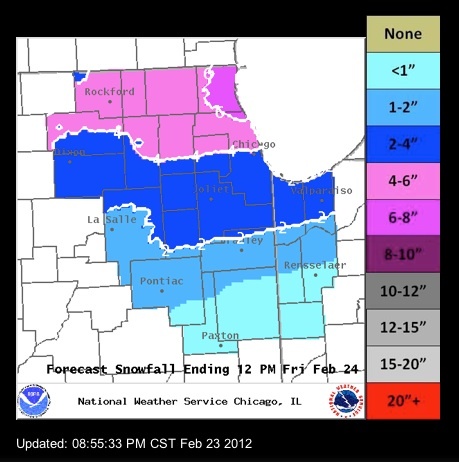 Most of Lake County and a small part of northeastern Cook County are in the forecast area for 6″-8″. Winter Weather Briefing Page — NWS Chicago. BORDER WITH LESSER AMOUNTS SOUTH TOWARD INTERSTATE 80. Arlington Heights Forecast as of 8:00 p.m.
Tonight: Rain and snow, becoming all snow after 9pm. The snow could be heavy at times. Some thunder is also possible. Low around 32. North northeast wind between 10 and 15 mph, with gusts as high as 20 mph. Chance of precipitation is 100%. Total nighttime snow accumulation of 4 to 8 inches possible. Friday: Snow. High near 35. Northwest wind around 15 mph, with gusts as high as 25 mph. Chance of precipitation is 100%. New snow accumulation of 1 to 2 inches possible. Friday Night: A 30 percent chance of snow showers, mainly before midnight. Mostly cloudy, with a low around 19. West northwest wind between 10 and 15 mph, with gusts as high as 25 mph.